Sunset from the Castle Lake Basin. Despite being home to three small lakes and a handful of even smaller tarns, Mount Shasta is not a great destination when it comes to trails leading to lakes. Fortunately, the nearby Trinity Divide boasts over 40 named lakes and numerous small, unnamed lakes and ponds. When looking up at the Divide from Mount Shasta City, it is not obvious to the common observer that these mountains contain several spectacular basins. Yet they are there and most of the best hikes in the Trinity Divide lead to glittering lakes set in steep walled cirques. Though there are many lakes and most of them are quite scenic, there are a few that set themselves apart with exceptional scenery. Naturally, these lake basins constitute essential elements of some of the most scenic trails in the Trinity Divide. This ranking is for lake basins, not individual lakes. There are many, solitary lakes that are incredibly beautiful but did not make the list because of their lonely nature. Looking down on the Gray Rock Lakes. The only lake basin in the Castle Crags Wilderness, the Gray Rock Lakes are a collection of classic alpine lakes. Consisting of three primary lakes, Gray Rock Lake, Upper Gray Rock Lake and Timber Lake, this relatively lightly used area makes a fantastic day hike or an easy overnighter. Gray Rock Lake, the largest of the group, is set against a series of cliffs and has excellent campsites along its north shore. The view of Gray Rock Dome from the lake’s west shore is great. Higher up is Upper Gray Rock Lake, the prettiest lake in the basin. It has all the features of Gray Rock Lake but arranged in a tighter yet taller way, making the overall setting more impressive. Nearby Timber Lake has a lush meadow at its northern end and is backed by a sheer cliff rising out of the water. A few unnamed tarns are scattered throughout the basin, including one high up in the rocky cliffs near the summit of Harry Watkins, the highest peak in the Castle Crags Wilderness. The Gray Rock Lakes Basin is accessed by way of a short, easy trail that is slung on slopes high above Gray Rock Creek. The basin is lightly used because the road is rough and the basin receives surprisingly little notoriety, considering how close to Mount Shasta City it is. The immensity of the Cliff Lake Basin is difficult to appreciate unless standing on the summit of Many Lakes Mountain. From there one can see how high the cliffs above Cliff Lake are and how broad the basin really is. In spite of the basin’s size, standing at Cliff Lake’s shore can still take on an almost claustrophobic feeling, due in large measure to the imposing rock wall that towers above the lake. There are five named lakes in the basin as well as numerous unnamed lakes set against the basin’s sheer walls. As one approaches, Cedar Lake is the first lake encountered, though it is not particularly inspiring and is surpassed by Lower Cliff Lake, itself, a fairly mundane affair compared to the incredible sights just a short distance to the south. Cliff Lake itself is an amazing body of water with 1,500 foot walls soaring out of the lake’s south shore. Upper Cliff Lake is hidden hundreds of feet overhead in a narrow rock basin. Surprising Terrace Lake is in a secondary basin just east of Cliff Lake. Though in a somewhat separated valley, Terrace Lake and its two subsidiary tarns are still in the greater Cliff Lake basin. Cliff Lake is truly one of the finest lakes in Northern California. It is less well known in part because a portion of the lake is privately owned. In addition, there is not a normal trail leading to the lake but an extremely rough road. Located at the southern end of the Trinity Divide, Tamarack Lake is an exceptional alpine pool. Backed by a massive cliff soaring hundreds of feet over the lake, it is a spectacular location. One of the larger lakes in the Trinity Divide, it sees surprisingly little use, a surprise given the beauty of the area. In addition to the stunning setting, Tamarack Lake’s beauty is enhanced by a series of small meadows that are scattered along the lake’s shore. The basin would rank high on Tamarack Lake’s merits alone but it is also home to the Twin Lakes. Both are very attractive but Upper Twin Lake is a first rate destination in its own right and would deserve consideration on its own strength even if Tamarack Lake was not found in the same basin. Not only is it deeper than its twin, Upper Twin Lake is highlighted by the same set of cliffs that rise above Tamarack Lake. Lower Twin Lake lacks the dramatic cliffs of its sibling but it is still a very scenic body of water. In addition to the three main lakes, there are a few unnamed tarns dotting rocky benches in the cliffs above Tamarack Lake. There is also a rather large and surprisingly scenic unnamed lake just north of Tamarack Lake. The basins southern position in the Trinity Divide means it receives fairly low use. Most who travel there are locals who are willing to endure the long, bumpy drive into the lake. They usually bypass the Twin Lakes entirely. One of the most beautiful spots in the Mount Shasta area, the Deadfall Basin is an excellent collection of emerald lakes set in a large red bowl on Mount Eddy’s western flank. The basin is populated by Lower, Middle and Upper Deadfall Lakes as well as a handful of small tarns, some of which are surprisingly large, deep and attractive. 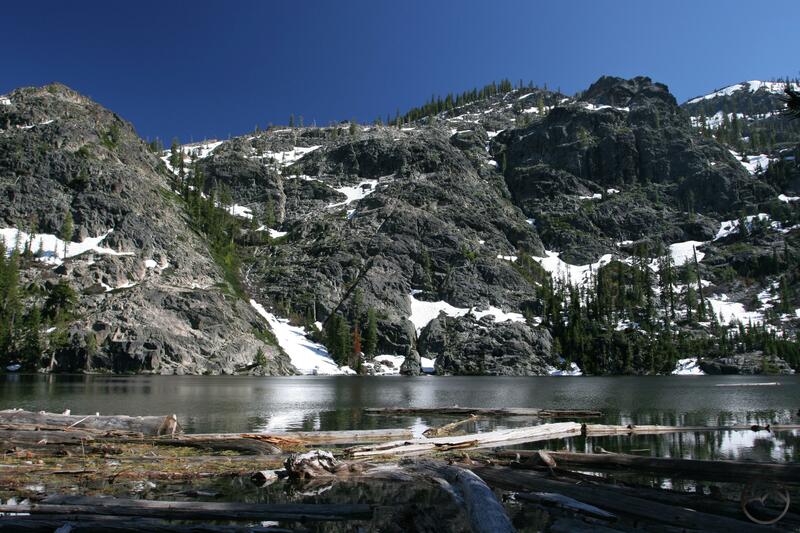 Lower Deadfall Lake is situated at the bottom of a large talus slope which is traversed by the Pacific Crest Trail. A little higher up in the basin is Middle Deadfall Lake, one of the largest lakes in the Trinity Divide. Encompassing 25 acres, the lake is backed by the tall rim of Deadfall Basin. Seated at the upper end of the basin is Upper Deadfall Lake. Though the smallest of the three lakes, it is by far the prettiest. Rimmed with meadow, the lake abuts the rocky slopes of the basin’s north wall. Soaring overhead is the pyramidal summit of Mount Eddy, rising to a point 1,200 feet overhead. Behind the lake is a small, spring-fed meadow with a creek lazily meandering through the verdant swale. Exploring the small tarns scattered throughout the basin reveals some hidden gems, especially the one hidden in the cliffs high above Upper Deadfall Lake. The best view of the basin comes from the summit of Mount Eddy, where all the lakes can be observed as well as some of the tarns. 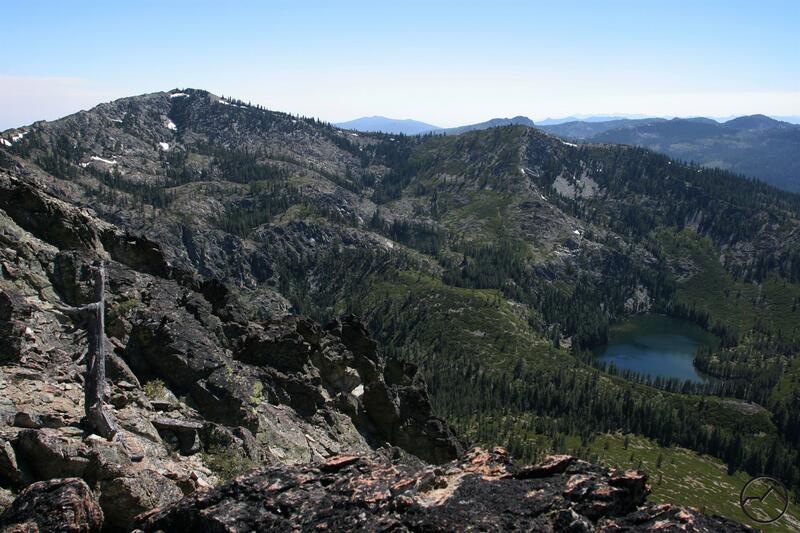 Of course, the summit of Mount Eddy is the finest vista in northern California and takes in much of the real estate between Southern Oregon and the northern Sierra Nevada. It probably comes as no surprise that Castle Lake is the best lake basin in the Mount Shasta area. Blessed (or cursed, as some may have it) with a paved road all the way to the lake, it is easy to reach and very, very popular. Of course, the lake is popular for a host of good reasons. 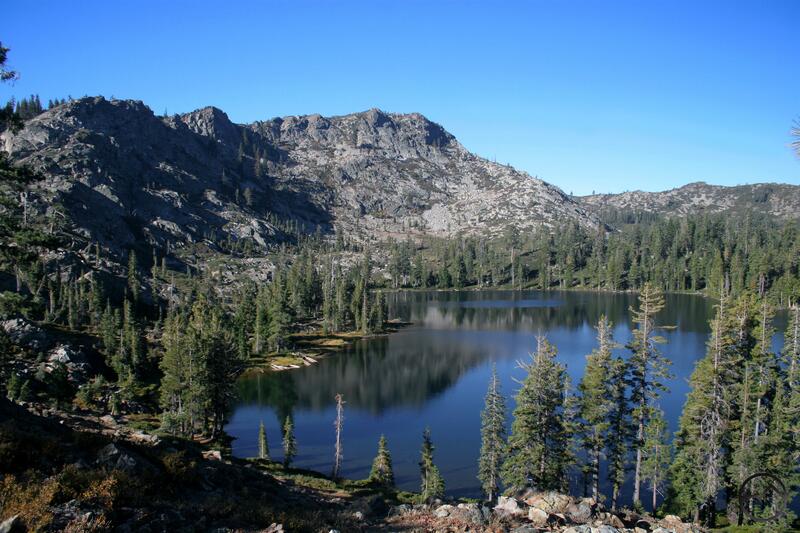 Castle Lake is the largest in the Trinity Divide and among the largest in the entire Klamath Mountains. 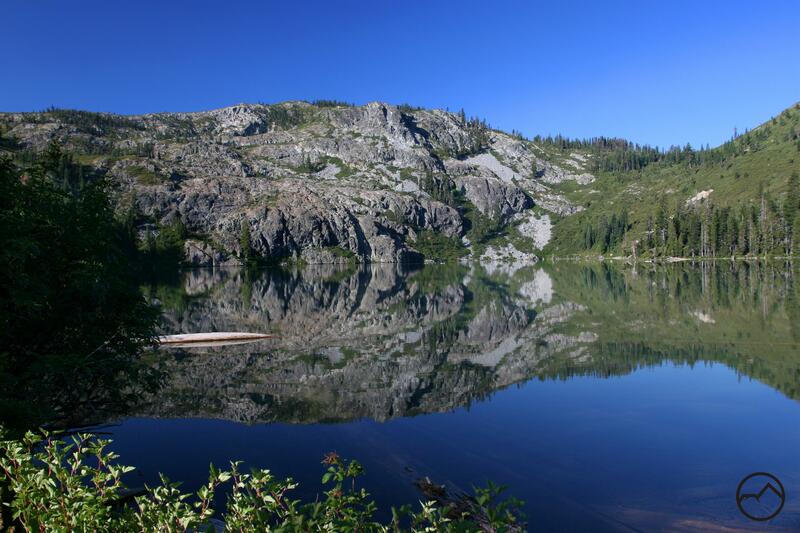 Only massive Caribou Lake in the Trinity Alps and impressive Ukonom Lake in the Marble Mountains are larger. The sapphire waters in Castle Lake are exceptionally pure. The University of California, Davis has established a limnological research station at the lake to monitor the water’s purity. Of course, the size and the water quality are not what causes the lake to rank so high. The bottom line is it is simply spectacular. The craggy cliff of Castle Peak’s north face emerges from the water and soars nearly 1,200 feet to the summit of the mountain. The sheer wall behind the massive lake is an amazing sight. In the spring, the sound of numerous waterfalls can be heard as runoff from the thaw cascades down into the lake. Of course, one can not discuss the Castle Lake Basin without mentioning diminutive Heart Lake. The small lake is tucked onto a bench high in the cliffs above Castle Lake. With an adjacent meadow and small tarn as neighbors, Heart Lake is an incredibly scenic spot. However, it is the lake’s breathtaking view of Mount Shasta that elevates it to one of the most tremendous locations in the region. Heart Lake is among the few lakes (though not the only one) that has a great view of Mount Shasta. 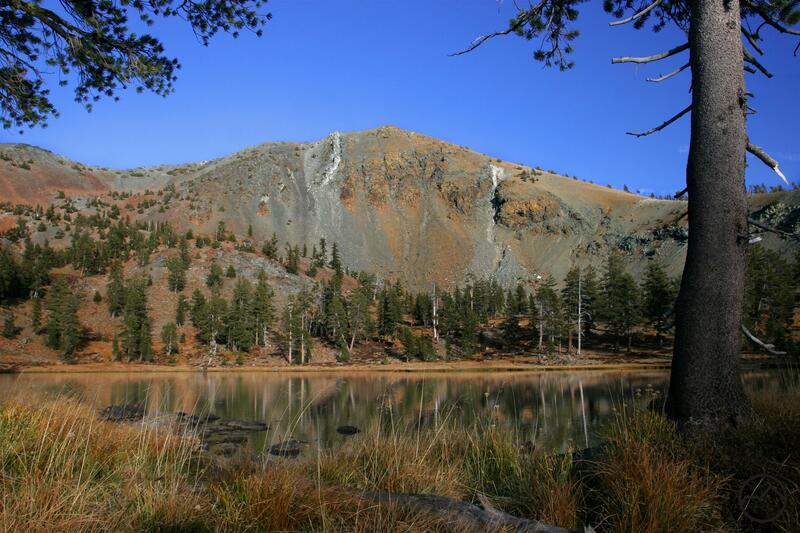 Of course, one can follow the Heart Lake Trail to the summit of Castle Peak for an even more expansive view that takes in most of the Trinity Divide, Mount McLoughlin in Southern Oregon and stretching south to Lassen Peak. It has a particularly impressive view of the Castle Crags. All of this scenic firepower, combined with easy access, makes the Castle Lake Basin an extremely popular spot. In spite of this, it is still a magnificent place. Yet those looking for solitude can still find it here and should not let the popularity deter them from enjoying this incredible spot. Is that Heart Lake? Never seen it from that perspective. Very cool. If you are referring to the first image on the post then you are correct. It shows Heart Lake on the bench above Castle Lake. The summit of Castle Peak has fantastic views. cliff lake is privately owned, but you an still go there? Sorry it has taken me so long to respond to you. Things got a little crazy at the homestead. Cliff Lake is only partially private property. The road in to the lake is public but once at the lake, it is best to stay on the east (left if facing the lake) side of the outlet creek. There is a small bit of private land on that side of the creek but for the most part, it is public over there. Definitely respect the owner’s and their cabins on the west side of the road!